The Al Khalid tank is based on the Chinese Norinco Type-90-II Main Battle Tank (MBT). This a Pakistani built tank, all of it except its engine is made in Pakistan. The engine is is a Ukrainian 6TDF diesel developing 1,200 hp. engine the same used in T-80/84 tanks. Besides a low silhouette, it is considerably smaller as compared to other modern tanks, with a maximum weight of 46 tons. The Al-Khalid MBT has a crew of three. It had a combat range of 400Km and is fitted with thermal night-vision devices. It has a maximum speed of 65-70Km/hr with an acceleration of 0-32Km/hr in 10 seconds. It's armor is made of composite material as well as explosive reactive armor. The Al Khalid is fitted with a smooth bore gun of 125mm which can also fire missiles. Al-Khalid's main gun is 125mm smooth bore with autoloader. The unique feature of Al-Khalid is that it is equipped with auto tracker system. It also has hunter killer capability which can track and engage more than one targets while on the move. The tank can operate fully even during night with thermal imagery systems. Tank's maximum speed is upto 70km per hour. Pakistan's development of the MBT-2000 Al Khalid began in 1988, and in January 1990 an agreement was reached with China to jointly design, develop and manufacture system. The design is an upgrade from the original T902M and work had been going on at China's NORINCO for some years. Initial prototypes were produced in China and fielded for trials in August 1991. Pakistan's manufacturing plant at Taxila was completed in 1992. Since then development efforts focused on improving the design for Pakistan's terrain and high temperatures. The engine of the T90 2M is replaced by the Ukrainian 6TD 1200hp engine, and a newly developed thermal viewer system has been added to improve nocturnal fighting capability. US$20 million were reportedly spent on the indigenous development of the Al-Khalid tanks over a period of eight years. Ukraine is a key partner in the production of the Al-Khalid tank which is a joint venture between China, Pakistan and Ukraine. Ukraine is also providing assistance to Pakistan in the Upgrade/Re-Build its T-59 tanks to the Al-Zarar Configuration, which is intended to match the T-80UD tanks. In February 2002 Ukraine announced that the Malyshev plant would provide another 315 engines for Al-Khalid tanks over three years. The contract's estimated value was $125-150 million. Ukraine possesses one of the most reliable tank engines in the conditions of hot climate. It is the result of the strategy of tank building development. At one time Ukraine and Russia, as two great tank powers, took two different ways of tank engine development. Ukrainian constructors chose the Diesel direction, while Russian ones the gas turbine, like many other countries. Now, according to the words of the chief designer of Ukraine armored troops, head of the Kharkov machine-building design office lieutenant general Mikhail Borisyuk, when the principal prominent buyers of armored equipment are located in countries with hot climate, the stability of engines with the ambient air temperature higher than 50 degrees has become one of the key factors for tanks reliability. In the extreme conditions of hot climate gas-turbine engines of China and Poland, created on the base of B-1, B-2 engine types, Russian engines, having had serious problems during testing in India, started to receive transient errors. At the same time Ukrainian engines on the tanks T-80UD, provided to Pakistan, showed high reliability. Heavy Industries Taxila started production of Al-Khalid in November 2000. The Chinese ground army has not made any purchase orders and will not use the same tank when it does decide to buy a next-generation armored vehicle. 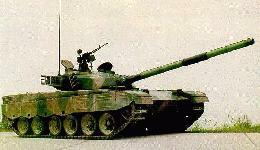 As of early 2002 Pakistan had about twenty Al-Khalid tanks in service. It had received its first consignment of 15 Al-Khalid MBTs in July 2001. Pakistan's Army reportedly hoped to produce a total of 300 more tanks by 2005. According to a 2001 report, Pakistan planned to add another 300 indigenous Al-Khalid tanks to its armored corps by 2007. On September 23, 2004, Pakistan received an additional consignment of Al-Khalid MBTs. In 2004 it was reported that the Pakistan army already had in its inventory 90 Al-Khalids fully operational. At that time the HIT was said to be "rolling out 50 Al-Khalids every year and by next year with additional allocations the production will be doubled." Pakistan plans to build a total of 600 Al-Khalid tanks for its armed forces. The production rate in 2004 was estimated by HIT to be 45-60 annually, dependent on budget allocation, and some 220 were in service as of May 2008. Development continues, with modifications in the fire control system and linkage [by the end of 2008 IISS thought that no more than the original batch of 45 tanks were in service]. During April 8-11, 2002, at DSA-2002 international exhibition of armament, Malaysian military and government officials considered the Al-Khalid tank as the best, and showed their interest in buying it from Pakistan. The UAE showed interest in 2003 in buying Pakistani military hardware including Al-Khalid main battle tank, Mushshak trainers and various other defence items that Pakistan can offer. In June 2003, Pakistan also decided to export Al-Khalid tanks to Bangladesh and to upgrade military-to-military relations with Bangladesh. In March 2006, Jane's Defence Weekly reported that Saudi Arabia was planning to evaluate the Al-Khalid in April 2006. Pakistani defense officials said the Saudi government may be interested in purchasing up to 150 Al-Khalid for $600 million USD.